1. Molly Made will be participating in Patchwork Santa Ana this Sunday! Please check out the Facebook Event for updates and more details. 2. I discovered the sweetest little shop in Fullerton called Belly Sprout! 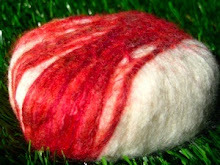 And I’ll be teaching a Mommy and Me Felted Soap Making Class there on June 17th. Belly Sprout features organic eco friendly goodness for babies, toddlers and moms. And, they have the cutest Craft Show display ever! This pic is from their website. I don’t believe the stilt walkers were around when I saw them at Patchwork. But, they add a nice touch. 3. Molly Made will be joining forces with The Orange County School of Domestic Arts! This great group of crafters and cookers are here in the OC and ready to get domestic on you! There’s so much to be gained by checking out this group. This workshop will cover two different, totally homemade cheese projects you can produce with inexpensive, readily available items to treat your family and friends. Learn to make your own butter (no churn involved) and flavor it with herbs. Create a tasty goat milk chevre and marinate it in garlic-infused olive oil. You will be the life of the potluck when you say that you made your cheese from scratch, and everyone loves a cheese-y gift! Event cost: $55. Email info@occheesemaker.com for reservations. Learn how to keep your beauty regimen toxin-free in this DIY balms, scrubs, screens and soaks session. All students receive a pencil-tip facial and a tube of homemade lip balm.